Crouching Tiger, Hidden DragonTraditional Chinese臥虎藏龍Simplified Chinese卧虎藏龙TranscriptionsStandard MandarinHanyu PinyinWòhǔ CánglóngWade–GilesWohu Ts'anglungYale RomanizationWòhhu TsánglúngIPA[wôxù tsʰǎŋlʊ̌ŋ]Yue: CantoneseYale RomanizationNgohfó ChòhnglùhngIPA[ŋɔ̀ːfǔː tsʰɔ̏ːŋlȕːŋ]JyutpingNgo6fu2 Cong4lung4 Crouching Tiger, Hidden Dragon (simplified Chinese: 卧虎藏龙; traditional Chinese: 臥虎藏龍) is a 2000 wuxia film, conceived and directed by Ang Lee. It features an international cast of Chinese actors, including Chow Yun-fat, Michelle Yeoh, Zhang Ziyi and Chang Chen. The film is based on a novel of the same name that is part of the Crane Iron Pentalogy, a wuxia series by Wang Dulu. A multinational venture, the film was made on a US$17 million budget, and was produced by Asian Union Film & Entertainment, China Film Co-Productions Corporation, Columbia Pictures Film Production Asia, Edko Films, Good Machine International, and Zoom Hunt Productions. With dialogue in Mandarin, subtitled for various markets, Crouching Tiger, Hidden Dragon became a surprise international success, grossing $213.5 million worldwide. It grossed US$128 million in the United States, becoming the highest-grossing foreign-language film produced overseas in American history. 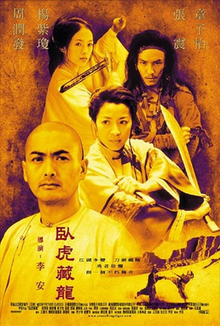 Crouching Tiger, Hidden Dragon has won over 40 awards, and was nominated for 10 Academy Awards, including Best Picture, and won Best Foreign Language Film (Taiwan), Best Art Direction, Best Original Score and Best Cinematography, receiving the most nominations ever for a non-English language film at the time (Roma has since tied this record). The film also won four BAFTAs and two Golden Globe Awards, one for Best Foreign Film. Along with its awards success, Crouching Tiger continues to be hailed as one of the greatest and most influential martial arts films. The film has been praised for its story, direction, and cinematography, and for its martial arts sequences. Plot: The film is set in 18th century Qing Dynasty China. Li Mu Bai (Chow Yun-fat) is an accomplished Wudang swordsman and Yu Shu Lien (Michelle Yeoh) heads a private security company. Yu Shu Lien and Li Mu Bai have feelings for each other, but because Shu Lien had been engaged to Mu Bai's closest friend, Meng Sizhao, before his death, Shu Lien and Mu Bai feel bound by loyalty to Meng Sizhao and have not acted on their feelings for one another. Mu Bai, after choosing to retire, asks Shu Lien to give his sword "Green Destiny" to their benefactor Sir Te (Sihung Lung) in Beijing. Long ago, Mu Bai's master was murdered by Jade Fox (Cheng Pei-pei), a woman who sought to learn Wudang skills. While at Sir Te's place, Shu Lien makes the acquaintance of Jen Yu (Zhang Ziyi), who is the daughter of rich and powerful Governor Yu and is about to get married. One evening, a masked thief sneaks into Sir Te's estate and steals the Green Destiny. Mu Bai and Shu Lien trace the theft to Governor Yu's compound, where Jade Fox had been posing as Jen's governess for many years. Mu Bai makes the acquaintance of Inspector Tsai (Wang Deming), a police investigator from the provinces, and his daughter May (Li Li), who have come to Peking in pursuit of Fox. Fox challenges the pair and Sir Te's servant Master Bo (Gao Xi'an) to a showdown that night. Following a protracted battle, the group is on the verge of defeat when Mu Bai arrives and outmaneuvers Fox. Before Mu Bai can kill Fox, the masked thief reappears and helps Fox. Fox kills Tsai before fleeing with the thief (who is revealed to be Jen). After seeing Jen fight Mu Bai, Fox realizes Jen had been secretly studying the Wudang manual and may have surpassed her in combat skills. At night, a desert bandit named Lo (Chang Chen) breaks into Jen's bedroom and asks her to leave with him. A flashback reveals that in the past, when Governor Yu and his family were traveling in the western deserts, Lo and his bandits had raided Jen's caravan and Lo had stolen her comb. She pursued him to his desert cave to get her comb back. However, the pair soon fell passionately in love. Lo eventually convinced Jen to return to her family, though not before telling her a legend of a man who jumped off a cliff to make his wishes come true. Because the man's heart was pure, he did not die. Lo came to Beijing to persuade Jen not to go through with her arranged marriage. However, Jen refuses to leave with him. Later, Lo interrupts Jen's wedding procession, begging her to leave with him. Nearby, Shu Lien and Mu Bai convince Lo to wait for Jen at Mount Wudang, where he will be safe from Jen's family, who are furious with him. Jen runs away from her husband on their wedding night before the marriage could be consummated. Disguised in male clothing, she is accosted at an inn by a large group of warriors; armed with the Green Destiny and her own superior combat skills, she emerges victorious. Jen visits Shu Lien, who tells her that Lo is waiting for her at Mount Wudang. After an angry exchange, the two women engage in a duel. Shu Lien is the superior fighter, but Jen wields the Green Destiny: the sword destroys each weapon that Shu Lien wields, until Shu Lien finally manages to defeat Jen with a broken sword. When Shu Lien shows mercy, Jen cuts Shu Lien's arm. Mu Bai arrives and pursues Jen into a bamboo forest. Mu Bai confronts Jen and offers to take her as his student. She arrogantly promises to accept him as her teacher if he can take Green Destiny from her in three moves. Mu Bai is able to take the sword in only one move, but Jen goes back on her word to accept him as teacher. Mu Bai throws the sword over a waterfall, Jen dives after it, and is then rescued by Fox. Fox puts Jen into a drugged sleep and places her in a cavern; Mu Bai and Shu Lien discover her there. Fox suddenly reappears and attacks the others with poisoned darts. Mu Bai blocks the needles with his sword and avenges his master's death by mortally wounding Fox, only to realize that one of the darts hit him in the neck. Fox dies, confessing that her goal had been to kill Jen because Jen had hidden the secrets of Wudang's best fighting techniques from her. As Jen leaves to prepare an antidote for the poisoned dart, Mu Bai prepares to die. With his last breaths, he finally confesses his love for Shu Lien. He dies in her arms as Jen returns, too late to save him. The Green Destiny is returned to Sir Te. Jen later goes to Mount Wudang and spends one last night with Lo. The next morning, Lo finds Jen standing on a bridge overlooking the edge of the mountain. In an echo of the legend that they spoke about in the desert, she asks him to make a wish. He wishes for them to be together again, back in the desert. The movie ends with Jen jumping off the bridge and Lo looks at her with despair.